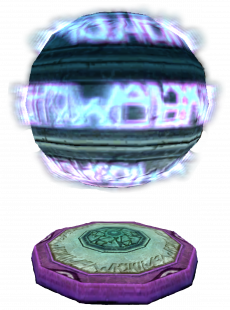 Switch Balls are technological objects exclusive to the haunted levels of Sonic Heroes. These switches have 2 different functions in their levels. In Hang Castle and Robot Storm, they flip the teams upside down. However, Mystic Mansion is the only stage that will perform teleport the teams from one room to the other. A light will spread onto the screen once touched by one of the characters of the team. Once they've been transported by these switches, they cannot return to the area where they've left off if they try to touch the switch that already took effect in the previous area. In the PS2 version of the game, there is a graphical glitch that causes the effect's alpha blending to change to additive alpha and if the change is active, it would rarely become fully opaque rendering it non transparent leaving some black on the edges of the effect. An additive switch effect, caused by a graphical glitch in the PS2 version of Sonic Heroes. A normal switch effect permeating on the screen. Another PS2 bug which forces the switch effect to lose transparency after the additive blending effect. This goes in effect at the wall crossing room using Team Dark. The switch ball becomes darker after transportation from a particular area. This page was last edited on 25 August 2017, at 08:41.